REPORTERS DON'T cry. At least that's what I kept telling myself as I tried to keep from tearing up while Shawn Aleong talked about living with an intellectual disability. "Believe it or not, some people still have that mind-set that - excuse my language - we are retarded, that we are slow, that we don't know what we're doing," said Aleong, 28. "And I always say, 'Why, because they think that we have a disability, do they think we are not capable?' A disability is not a handicap, it's not a disease. It's a blessing." "Yes," he says without skipping a beat. "I thank God for my disability, because every time I look at myself, I see myself getting better and better, and I know anyone with a disability can do the same." So that unexpected and slightly embarrassing display of emotion? It was a reaction to this impressive young man, who, with the help of a dedicated mother and other supporters, never let a disability hold him back, and every day pushes past perceived limitations on behalf of himself and others. And if I'm being really honest, some of those tears were probably for my late uncle, too. Angel was physically and intellectually disabled, and I always wondered what he would have been capable of if he had more opportunities. No need to wonder about Aleong, a student at Temple University who lives in Wynnefield, or other young people with disabilities who are getting a once-in-a-lifetime opportunity to volunteer for the upcoming Democratic National Convention. The Arc is recruiting up to 100 volunteers to serve at the DNC this summer, including Aleong and William Del Toro Vargas. Their resumés rival any of their contemporaries'. Del Toro Vargas, 21, is a pre-law student at Temple University who recently received ARC's top honor, the Eleanor Elkin Award, for advocating for legislation that led to millions of dollars for employment opportunities for people with disabilities. These two are relentless advocates. 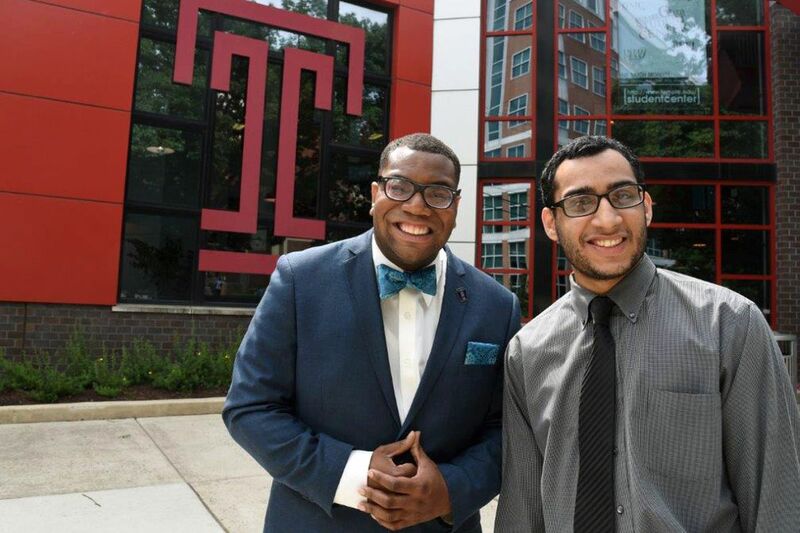 In addition to all the boards he sits on, Aleong, who interns at the Temple University Police Department and is considering a career in law enforcement, wants to educate police officers about people with disabilities to improve interactions between the two. And if they get a chance to meet Hillary Clinton or Bernie Sanders at the DNC - well, they have plenty they'd like to say to them, too. Del Toro Vargas would love to talk to them about ADA compliance. "Even with laws in place, the problem is often enforcement," he said. Aleong agreed. "How can we call ourselves a great nation if we don't include all people?" he said. "How can we say that everybody is equal, and sometimes you have people with disabilities being treated unfairly or not getting the services that they need?" Can you understand why I shed some tears now? These two young men with intellectual disabilities get what's important in a way that I'm not sure even those running for the presidency do. I suggested that they run for office one day. And what's to stop them? "A lot of times, those kinds of opportunities to practice your skills, to be a leader, to be seen as giving back to your community, aren't given to people with developmental disabilities," said Tanya Regli, executive director of the Arc of Philadelphia. "We maybe patronize them, we maybe do services for them . . . but we're not allowing them to actually practice their leadership skills and be an equal partner with their peers. So the value that they bring is very powerful." When the DNC's host committee advertised for volunteers, it said it was looking to showcase the best of Philadelphia. It definitely got that with Aleong and Del Toro Vargas.